We’re happy to help you with your questions about the High School Spanish app. Contact Us. Below is a listing of bugs and issues with the app that we’re aware of and currently working on or have resolved. 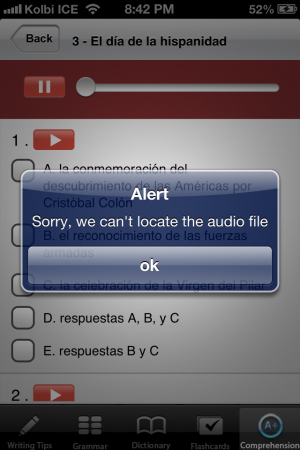 Read below to find solutions for known problems and recent updates on for the High School Spanish App. The update is live and the bug that was responsible for missing data has now been fixed. 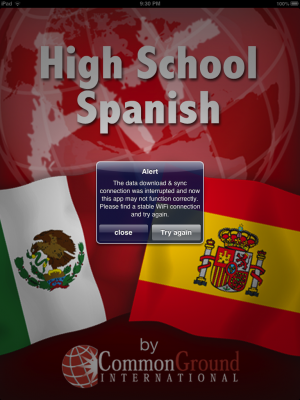 Get the latest version of the High School Spanish App in iTunes! We’ve discovered the issue with the app randomly missing content for certain users. There is a design flaw on the app development side (our problem and we’re SOOO sorry) that is storing app data in the wrong place on the mobile device; we are working hard to fix it ASAP. In the mean time, you may lose data if you are nearing the storage limits of your device. Apple iOS automatically runs a “cleaning” script on devices that are nearing their storage limits and during that script it removes all cached data. Unfortunately, this is affecting app content for now. You can do a couple of things to make sure that you don’t lose your app data while we’re fixing the design flaw on our end. The best thing to do is create more storage space on your device. You can do this by storing those older photos and videos somewhere else, removing old apps or other media files you no longer use, etc. This will create more space on your device and not trigger iOS’s “cleaning” script to run. We believe that if you keep about 1Gb of storage free on your device the cleaning script won’t run. Again, this is not your problem, it’s ours – a total oversight in the programming. So, we’re hustling to get it fixed. Thank you for your patience. This was a great app until it just stopped working completely. Just one day I opened it and there was nothing there. All the sections said that they were empty. I can’t figure out how to fix this so the app is completely useless right now. Too bad because it was great! This issue is occurring only on some devices. It could potentially happen if a sync or update process is interrupted by navigating away while new data is downloading or something. It’s impossible to know what happened with this user specifically, however if you ever encounter an issue with the app, please let us know and we’ll help you solve your problem right away. If you need help fixing a problem, please use the Report a Problem form so we can help you as quickly as possible. 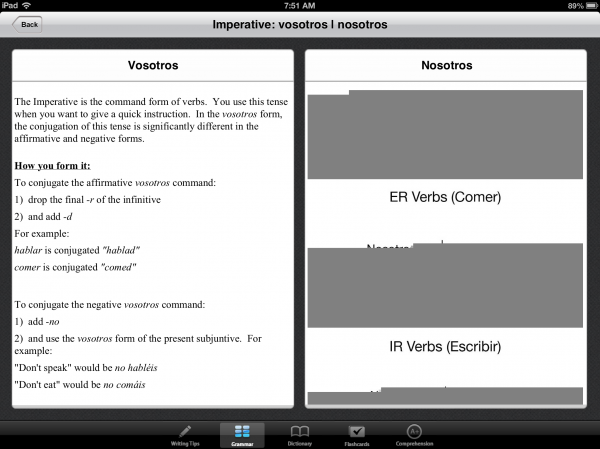 Then you can write a review about how awesome High School Spanish App is, AND that we provide great support as well! As of about 4:00pm today, v1.6 is live in App store now and all issues with media downloading are resolved. If you update from v1.4 you will have no issues. If you installed v1.5, please update to v1.6 and then perform the manual sync function by pressing the settings icon (gear image in the top left corner of all main category pages). This may take a few minutes and you should be on a steady WiFi signal, but it will ensure that all media files download for your use. Thank you for your patience – enjoy High School Spanish! We discovered this morning that images, audio and video files are not downloading for new users of v1.5. Users who are updating from v1.4 are not experiencing any issue, but new users are not receiving all of the data and features included in v1.5. We have removed v1.5 from sale for now and are awaiting v1.6 to be approved by Apple. If you are new v1.5 user, what is broken specifically? What is working fine for new v1.5 users? New v1.5 users should be able to use the dictionary and flashcard sections of the app without any issue. We have submitted v1.6 to Apple today and will have it live for updating and new downloads ASAP. 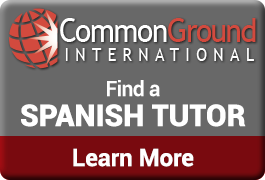 After making some changes in server configuration to resolve previous problem, some users are reporting that High School Spanish crashes upon data sync. If you encounter this error, it is best to delete the app from your device and reinstall from the AppStore. This will resolve the issue. This issue has been resolved. If the automatic sync function does not fix the issue on your device, you will want to delete the application from your device and re-install. This will not cost you anything of course, you have already paid for the app. 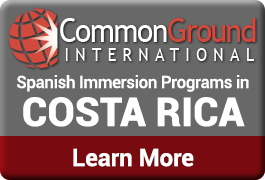 If you continue to have issues with your Spanish listening comprehension activities after the fresh install – please contact us and we’ll help you troubleshoot. We have confirmed this this is an issue on our server side and we’re working hard to get it resolved ASAP – thank you for your patience. Error in server configuration was not allowing for app to download completely. Issue resolved- thank you for your patience! We are troubleshooting the issue and expect to have it fixed soon. Initial Download: Problem fixed – now users are required to be on WiFi to open the app the first time. Dictionary-Flashcard Integration: Problem fixed – enjoy studying flashcards! Longpress on app icon in your main screen until the (x) shows up. Go back through iTunes and re-download (you still own the app – so it won’t cost you anything). Initial Download: Make sure you are on a strong WiFi connection for the first time you open the app. It needs to sync with our server and download all of the data that you’re wanting to use! If you rely on a 3G or 4G connection with your device, the sync process will likely get interrupted and it will look like your app is blank – no data. Double tap the home button (round button on phone) and you’ll see the app running probably. (if you don’t see it in that tray, jump to step 4 below). Long press the app until it wiggles. Tap the (-) to stop it from running. If the app downloaded and synced fine initially and you just want to re-sync, it will only take a few seconds to sync with the server when you open it up fresh again. 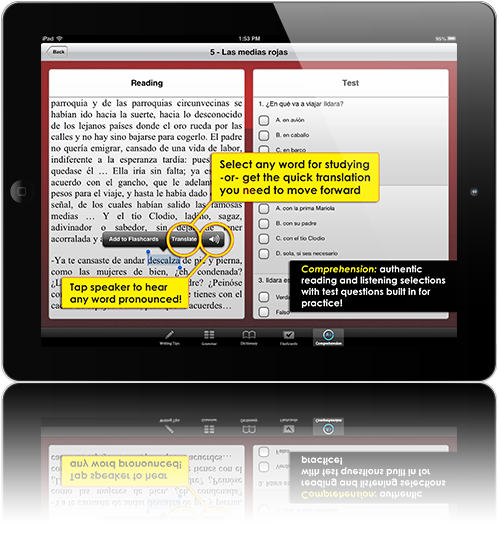 Dictionary – Flashcard integration: We have discovered a bug in this version with adding Spanish terms to personal flashcards from the dictionary. The terms add fine to the folder you designate/create, but when studying those terms they will display in English on both sides of the card. Version 1.3 is being submitted for review by Apple and this bug will be fixed ASAP. If you detect a problem or if something doesn’t seem right, please contact Rory Foster directly.